Dr. Yoshihide Hagiwara, a world-renowned scientist, inventor, and entrepreneur, graduated from Kumamoto University in Japan as a research pharmacologist. Early in his career, Dr. Hagiwara developed several highly successful drug formulas, becoming the owner of a leading Japanese pharmaceuticalcompany. 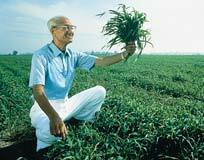 In order to capture and protect the delicate nutrients and enzymes in freshly harvested young barley grass, he developed a unique extraction and spray-dry process that earned him Japan's prestigious Science and Technology Award. This process makes possible our powdered, nutrient-rich Green Magma¬. Today, Dr. Hagiwara is the president of the Hagiwara Institute of Health and continues to pioneer advances in medical research and biotechnology. Getting the nutrients from the plant to people was another matter. Dr. Hagiwara struggled at first. 'I was told by people who used my product that it was not effective.' He accepted this challenge and kept working, eventually discovering that, 'I was subjecting the barley to too much heat...killing the active ingredients.' To avoid this, Dr. Hagiwara created a secret and patented drying process, guaranteeing that all active nutrients remained active. The result of all of this - over 20 years of research; the ideal location to cultivate barley; the green barley leaves, rich in nutrients; and the sophisticated manufacturing process - is Barleygreen,the best green juice product there is. 1949: Bachelor's Degree in Pharmacology, Kumamoto University. 1991: Visiting Professor, Environmental Toxicology Department, University of California at Davis, California. 1993: Established Hagiwara Institute of Health in Kobe, Japan's largest privately-funded cancer research facility. 1995: Received a Special Award from the Brazilian Government for his many contributions to world health and welfare.